Developing outstanding teachers of computing, to engage & inspire the digital creators of tomorrow. 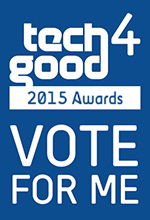 Alan writes: I’m very proud that our JamPackedUK project has been selected as a finalist in the Tech4Good awards. Please support us, by voting for us and by encouraging as many others as you can to vote for us. The voting page is slightly complicated; you need to provide an email address first to authenticate your vote, then select our JamPackedUK logo among the other finalists and finally say where you heard of the awards. Click here to vote. We’re one of 27 finalists and voting closes at the end of June. We were successful in applying for grant funding from the DfE, The Raspberry Pi Foundation and RM Education. We are extremely grateful to our sponsors for this support as this funding enabled us to take our events and activities on a road show tour focusing on the north of the UK. Since November, we’ve led 47 different events and activities to support our aims. 2500 teachers, adults and young people have attended a JamPackedUK event since November and 1500 teachers registered for our 14 online webinars which are available in our Toolkit. We’ve received outstanding feedback from participants and many teachers attending our events have told us how they have gone on to change their teaching as a result of participating and some have gone on to organise their own community events as a result. Saturday 29th August 2015 at: Hamilton Grammar School. Visit our Raspberry Jam event to share the exciting potential of the Raspberry Pi computer. No equipment or previous experience required. Click ‘TICKETS’ here for more details. Friday 28th August 2015 6.00-8.45pm at: Hamilton Grammar School. We welcome children and adults of all ages and experience levels to join us as we discover the excitement & power of computer science, through an enjoyable, team-based activity evening. Equipment provided. Free entry. Friday 28th August 2015 at: Hamilton Grammar School. Free CPD for teachers of Computing with pupils from the host school. Click on ‘tickets’ for more information. Friday 5th June 2015 at: All Hallows RC High School, Salford Free CPD for teachers of Computing and their pupils. Click on ‘tickets’ for more information.